Joe Ditzel, a member of the American Federation of Labor (AFL) Federal Labor Union (FLU) local #18384, described his local as a “rank and file union built by the rank and file.” The fact that they had this “strong union…in Toledo wasn’t due to anything the AFL did” but what “the workers [did]…themselves.”1 His sentiments reflects the grassroots energy and action that shaped this auto worker union local and made it “the beacon light for automobile workers throughout the country” before the establishment of an International United Auto Worker (UAW) union in 1935.2 During that time, as Ditzel described it, they “more or less had the idea that anything that had to be done, [they would] have to do it [themselves].”3 That attitude of self-reliance was rooted in the origins and development of the FLU local marked by struggle and rank and file militancy and activity. This thesis focuses on that historical narrative from the perspective of the workers within FLU local #18384. From this bottom-up approach, one sees the social and community dynamics from which these individuals interacted with and drew strength from. This local dimension reflects what Staughton Lynd calls “alternative unionism” that he claims existed before the formation of the labor federation Congress of Industrial Organization in 1935. This model of organization, according to Lynd, was characterized by grassroots, community-oriented, democratic entities, rooted in local autonomy. As an FLU local with little institutional support from the national AFL, the formation and development of this Toledo auto worker union was based on the grassroots energy of its membership in relation to a leftwing influence and the community. Receiving its charter in August of 1933, the FLU local #18384 was, in part, a product of President Franklin Roosevelt’s National Industrial Recovery Act (NIRA) – his first New Deal Initiative to counteract the economic and social impacts of the Great Depression. Passed in June 1933, section 7(a) of this legislation proclaimed the right of workers to organize and collectively bargain with employers. Although the text of section 7(a) was poorly worded (and ultimately, poorly enforced) this historic government sanction of unionism inspired an outburst of labor organizing across the country. Following the passage of NIRA, the AFL, a federation of all the trade unions in the US, sought to take advantage of this unionizing impulse by announcing a campaign to organize workers in the auto industry. Steeped in conservative craft unionism (organizing workers along particular trades or occupations in various industries), the AFL brought these auto workers into federal labor unions with the plan to eventually parcel them out to its various trade unions. These auto worker federal labor unions had a direct relationship with the national AFL but little contact between one another. This thesis argues that the grassroots, community oriented struggle of “alternative unionism” that defined the origins of FLU local #18384 became the basis for broader national struggle within the auto industry. As the historian Rosemary Feurer argues, “any national framework of unionism required building solidarity at the local level” in which “the union movement needed to be able to address the local structuring of the political economy to confront effectively the power of capital at the national level.”6 Much has already been written about both the 1934 Auto Lite strike and the 1935 Toledo Chevrolet strike, as they were critical moments in the development of the broader labor movement in the automobile industry during the 1930s.7 But the local dimension underlying these important episodes (and which this study seeks to illustrate) has yet to be fully examined. 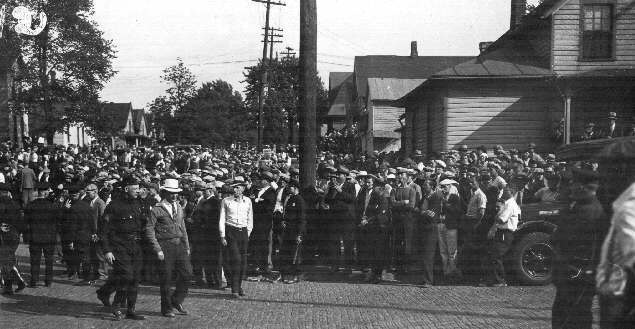 In this respect, the events of the 1934 Auto Lite strike culminated in a community uprising and a potential general strike which successfully challenged the power structure of business hegemony over the city’s economy. This subsequently forced the Auto Lite Company to sign a collective bargaining contract with the FLU local. The efforts of a rank and file group within the local #18384 allied with the Lucas County Unemployed League (LCUL) galvanized the community through mass civil disobedience to eventually defeat a devastating court restraining order on picketing initially accepted by union leadership. Moreover the turn towards mass civil disobedience ushered in the subsequent turn of events that created ultimate victory for the FLU local in the form of a signed contract with the Auto Lite Company. This outcome also reinvigorated the broader labor movement in Toledo. The militant cadre of active rank and file members that emerged from the conflict of the second Auto Lite strike in 1934 became the progressive element within the Toledo auto worker union. They were shaped in some fashion by the Auto Lite strike experience as well as their ties with LCUL and the Workers Party to form what historian David Montgomery calls “the militant minority” those who “endeavored to weld their workmates and neighbors into a self-aware and purposeful working class.”8 Individuals within this group, in an atmosphere of renewed organized labor activity in the city, became the catalyst for organizing the Toledo General Motors (GM) Chevrolet plant as well as the subsequent strike there in 1935. The walk out which successfully stopped operation in this key transmissions plant and shut down GM production in plants around the country gave the action national implications. Moreover, during this time, the Toledo strikers initiated an effort to coordinate nationally among GM FLU locals for a common strike policy in order to obtain a shared agreement. When this initiative was squashed by both the AFL national leadership and local #18384’s executive board, the progressive elements among the rank and file of #18384 turned to the broader rank and file movement involved in creating an International United Auto Worker (UAW) union based on a democratic, bottom-up model controlled by membership. With that institutional support more or less in place, the rank and file initiative to obtain a national agreement from GM that began during the Toledo Chevrolet strike of 1935 reached a climax with the victorious Flint sit-downs of 1936-1937. Both in the period leading up to, and during, that historic conflict, leaders and members of UAW Local 14 (formerly the Toledo Chevy unit of the FLU local #18384) played a crucial role in supporting the effort. However, during this period, the activism of progressives within the FLU local was rarely uncontested. As James Roland, one of the leading progressives in the Toledo union put it “there were some of them that were conservative and reactionary and we were progressive…that’s the way it was.”9 During the Auto Lite strikes, some members. especially on the executive committee, distrusted the presence of the left wing groups. Such attitudes spilled over in the months following the Auto Lite strikes when the progressives, some of whom still had ties with the LCUL and the Workers Party, attempted to extend their influence by running slates of candidates during elections for both shop committees and the executive committee. During that period, the AFL national increased its influence on the executive committee, at the request of union officers, through the presence of its representatives to help work out the factionalism and through its control of funds supplied to the local. The 1935 Toledo Chevrolet strike further demonstrated the division and clash between progressives and parts of the executive committee. Following the establishment of the UAW International, indifference on the executive committee towards the interests and needs of the Chevrolet unit as it faced efforts by GM to undermine their union led to that shop’s petition for a separate charter. As Local 14, the progressives came to the fore in leadership of the union and could push forward their desire to get a national agreement with GM as well as support organizing efforts around Toledo. Through this rank and file history of the Toledo FLU one gets a local understanding of what became a developing grassroots movement among auto workers underlying the creation of the UAW International. This, in part, is what made the Flint sit-down strikes so successful and brought instant legitimacy to the organization. Bob Travis, one of the primary organizers of this historic struggle, emerged out of the Toledo Chevy strike as a member of its shop committee and drew his early inspiration and influence from Roland to get involved and his interest in left wing politics. Moreover, historian Sidney Fine asserts that “the UAW did not expect to win the GM [Flint] strike by the use of words but rather by the mobilization and deployment of such power…available…to put maximum pressure on the corporation.”10 Local 14 provided one of the primary bases of membership support to reinforce the efforts taking place in Flint at moments when such help was needed both inside and outside the plants. The rank and file energy emanating out of Toledo to support this national effort can only be understood by examining the successful struggles that entrenched the presence of organized labor on the local level. 2. Burke Cochran, “Dillon to Pack Convention of Auto Workers,” New Militant, Aug. 34, 1935. 3. Ditzel, interview with Mosier, March 5, 1981 and April 16, 1981, p. 48, Blade Rare Book Room. 5. Elizabeth Faue, Community of Suffering & Struggle (Chapel Hill:London: The University of North Carolina Press 1991), 12. 6. Rosemary Feurer, Radical Unionism in the Midwest (Urbana : University of Illinois Press, 2006), 234. 8. David Montgomery, The Fall of the House of Labor (Paris: Cambridge University Press, 1987),2.